What could possibly be more relaxing than sitting back sipping a cold beer, wine or just a soft drink after an exhausting day working. It doesn’t matter whether you go out to work or work at home both are equally taxing and so being able to sit outdoors for a few moments savoring the days end before starting the evening’s chores, is often a welcome relief. And what better way to spend the time, in your own garden, under a stylish pergola. Pergolas are available in many styles and types but my particular favorite is one that has the wall on one side that provides privacy and gives you protection from the elements . Just look at the one pictured above, what a great place to entertain your family and friends. The Sonoma Arched Cedar Pergola shown above has a covered in roof, but you can have a lattice shade roof if you want to grow vines, wisteria or have climbing roses trailing over the lattice work. Imagine growing grapes and being able to pick and eat them fresh of the vine when they are ready. The vines will eventually fill in the lattice work giving you natural protection from the elements. Sonoma pergolas are made from white Cedar wood which is then dip stained before being precision cut. It is recommended that you re -stain your cedar pergola every 2 to 3 years. There is a 1 year warranty on the exterior finish and a 3 year structural warranty on Sonoma pergolas. 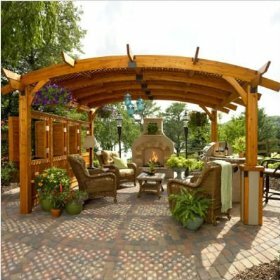 The beautiful Redwood Finish pergola shown includes the anchor system and comes ready to assemble. Assembly requires 2 people with moderate ability. The 4 panel window privacy screen is an optional extra, but well worth the money to give your pergola that cozy, private feel. And the Redwood Finish Stucco Bases (2 per carton) add a style and elegance to the overall Pergola design. This is one pergola that is going to get you plenty of compliments.